The Ford Taurus was quite a phenomena when it hit the market in 1986. Coming from a traditional automaker like the Ford Motor Company this mid-sized front wheel drive vehicle was considered very innovative for a family sedan. It was met with much enthusiasm and a high volume of sales. the years from 2000 to 2009. In this time segment there were 4 trim levels offered. They were the luxury editions, SEL and SES, along with the mid range SE and economy version LX. Earlier used Ford Taurus's included a station wagon option. Two engine types were made available, both being 3.0 liters and 6 cylinders but one generating 155 horsepower and the other 200 horsepower. Both were mated to a 4-speed automatic transmission. Around the year 2000, the Taurus would rank in the top third of the best family sedans to own. As the years progressed, overall competition, especially that from Japan, weakened its popularity. 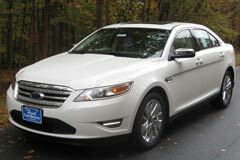 A used Ford Taurus is a good choice as a second family vehicle. It has plenty of room for the kids as well as groceries and it has an appealing style.